Why Nurses Need @GoogleDoodles: #RN Innovator No. 17, Meb, Nurse Athletes & The Power of Weird Shoes. 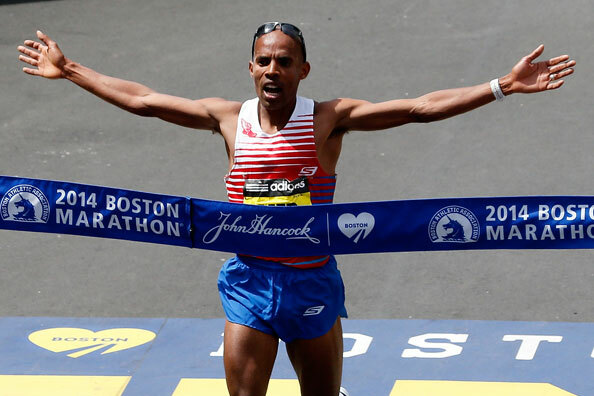 Did anybody else catch the story on Meb, the first American to win Boston since the ’80’s, and the oldest since 1930? I mean, the back story, about how Nike dropped him a few years ago, and he sped through the finish line yesterday in a pair of Skechers? Made me wonder (all day) how much that rejection from Nike had to do with his win. If he thinks at all like me, I’m pretty sure it made him train harder and run faster just because he was told he wouldn’t amount to anything. What would happen if nurses did the same? Below is my letter to the Doodlers about a program that makes athletes out of nurses. If anybody needs to have marathon-like stamina, it’s us. Read up and start lacing up those sneaks. I pretty much thought about one article all day today. It came on the front page of my paper, and stuck in my brain through all of my almost-vacation-end activities. The article was about Meb Keflezighi, who we all know won the Boston Marathon yesterday. What I didn’t know, which the article told me, was that the oldest winning athlete since 1930 was pretty much written off three years ago. Nike dropped him, and he barely got a sponsorship with Skechers, which he wore across the finish line in yesterday’s momentous race. I couldn’t help but wonder how much of that rejection by Nike had to do with his win. Was it the common urge to rise in the face of obstacles, the adrenaline surge when given a negative ultimatim, the don’t-you-dare-tell-me-what-I-can’t-do spirit? If he had been kept on by Nike, would he have won, or so incredibly? Sometimes I feel this way. Ok, a lot of the time. The urge to prove nay-sayers wrong comes on strong, and immediately. Over the years, I’ve learned to drop the small issues and focus on the big ones. Nursing is a big one. A lot of people – especially nurses – have told me that the majority of my ideas about the profession are impossible, laughable. I keep these comments handy on days I feel discouraged; they are the sponsors that will wish their sneakers on my feet come finish line. I sent out a silly Tweet about Meb after I read his story this morning: Rejection is just the starting line to a new race. It ran through my head all day, and I think I’ll keep it there for awhile. Who knows how powerful its message will prove. In light of all this run-spiration, it seems fitting to tell you about Dr. David Hrabe, PhD, RN, as today’s nurse innovator. Dr. Hrabe currently teaches at Ohio State’s College of Nursing, where he started and runs their Health Athlete initiative, a program (the very first of its kind) that trains nurse athletes to use their stories through energy management, goal assessment, and healthy lifestyle choices to revitalize themselves professionally and personally. Through the tenets of energy management, nutrition management, and movement for energy management, the program aims to instill confidence in health choices amongst its participants, ultimately shaping healthy outcomes. Nurses are a population with significant health problems related to the stress of our jobs. Our obesity rates are higher than the general population, we are regularly injured on the job, and our dissatisfaction with our working conditions is a well-documented topic. This program is fantastic – it seems to focus on the knowledge of nurses, the uniqueness and importance of their stories, and the equal value of their health. I’d say that’s pretty innovative. I’ve heard many a nurse say that the job will kill you. Years of hard labor at the bedside wears on the body and emotions, draining of energy. Many have thrown in the towel for “winning” – just like Nike did for Meb. Maybe if all hospitals offered Dr. Hrabe’s program, we’d be skipping across new and exciting finish lines in shoes made for winners. ← Why Nurses Need @GoogleDoodles: #RNgoogledoodle Innovators No. 16, the Short-Staffed Nurses of America.